BEING A DINOSAUR IS HARD. The first day of school is not working out. T.R. (for T. Rex) knows he's in trouble when he discovers that he's bigger than the school bus. He's bigger than the teacher. He's bigger than his desk, and it goes without saying that he's bigger than the other kids. And his friendly way of saying hello, RAWR, doesn't go over too well either. Even though T.R. is on his best behavior, being helpful assisting the crossing guards in front of the school and tiptoeing around the classroom aquarium, his classmates remain skittish. He uses his best table manners, tipping the table in the cafeteria carefully so that his lunch slides deftly into his toothy mouth. T. R. even remembers to say "Excuse me," for that lapse, but for some reason, nobody wants to sit with him at lunch. But at recess, he finally gets a break when the ball gets stuck on the roof. It's not even a stretch for T.R. to retrieve it. And when the kids discover that sliding down his tail is lots of fun, it looks like T.R. has got this school thing working for him at last. 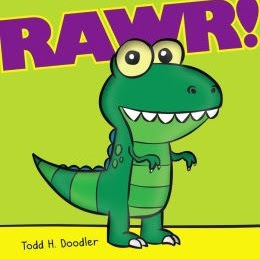 Todd H. Doodler, famous for his glorious giggle starters, the Bear in Underwear books, breaks out a new character in his latest, Rawr! (Scholastic, 2013), complete with a touchably poofy fabric relief likeness of his hero on the cover. Bringing a lighthearted look at fitting in at school as a premise, Doodler's simple comic illustrations and story line have something of the minimalist charm of Norman Bridwell's early childhood classics, Clifford The Big Red Dog and its many sequels, and T. Rex's lusty "RAWR!" may prove a popular greeting among the story circle set.